Discogenic Chronic Low Back Pain (cLBP) is a disabling disease for the patient, and an extremely expensive condition for society. Today, spinal fusion is the only available treatment for patients who do not respond to analgesics and physiotherapy. Our solution, currently tested in clinical phase 1b, aims at changing that. Treating the root cause of the pain. Not the symptoms. Instead of costly procedures, such as spinal fusion or long-term physiotherapy, our cLBP treatment is an easily performed, single injection procedure that stabilizes the disk by transforming it to connective tissue. Unlike any other currently available treatment this has the potential to permanently remove or reduce the pain significantly faster than surgical intervention. 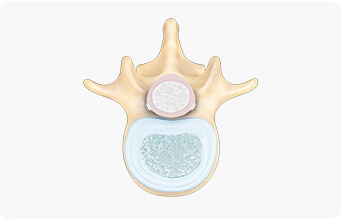 An intervertebral disc consists of two main parts: the disc centre and the wall. The disc centre consists largely of a highly hydrated gel together with nucleus pulposus cells and fibroblasts. When a disc degenerates it becomes less stable and pro-inflammatory substances formed during the degenerative process can leak from the inner core of the disc. Pain-sensing nerves within and outside the wall of the disc are activated. These processes cause back pain. 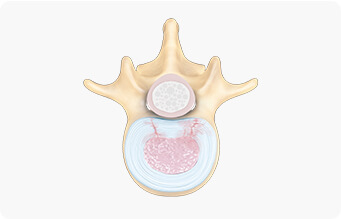 By injecting a biologically active substance directly into the degenerated intervertebral disc, the cells are triggered to produce collagen and transform the damaged disc into connective tissue. This helps re-stabilize the intervertebral segment and reduces diffusion of pro-inflammatory substances. We are currently taking the next step in our exciting journey towards an injection-based treatment for chronic low back pain. With our STA-363 treatment undergoing clinical phase 1b, we are one step closer to market. We are participating in several conferences and industry event every year. Please do not hesitate to contact us to meet up.